Oh Three Oh Four: Silly Bee's Chickadees Mellypalooza 2014 Review & Swatches + Giveaway! Silly Bee's Chickadees Mellypalooza 2014 Review & Swatches + Giveaway! Mellypalooza 2014 is a mix of matte and satin circle and hex shaped glitter in orchid, pink, aqua, garnet and golden yellow. All nails are 2 coats over 3 coats of May's Pie of the Month Polish: Banana Cream Pie. Now for a chance to win a bottle of this polish and some fun extras from Silly Bee's Chickadees! 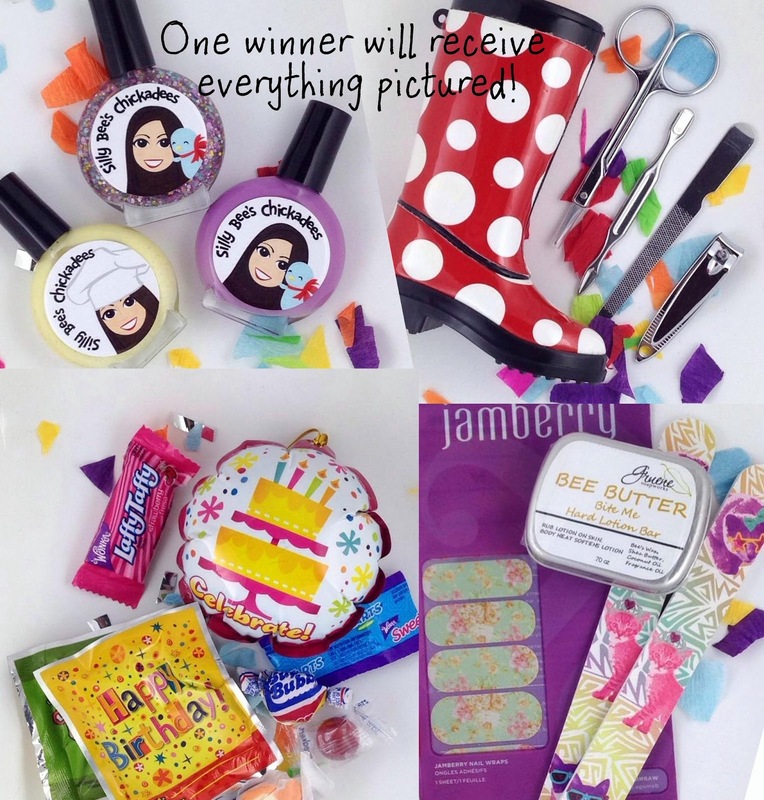 One winner will receive everything in this photo: 3 full-size bottles of Banana Cream Pie, Mellypalooza 2014 and Velvet Orchid; A set of Jamberry wraps, a set of nail files, rain boot manicure set, a mini lotion bar, candy and 3 wack-a-packs! Everything will be done via Rafflecopter. There will be 1 winner and this is not open internationally, sorry! This giveaway will end June 6, 2014 at 12 AM EST. The winner will be announced here and on Facebook. The winner will have 48 hours to respond to me or a new winner will be chosen in their place. Silly Bee's Chickadees is not responsible for lost/damaged deliveries. All products are new and unused. If you cannot enter using Rafflecopter please leave me a comment or email with your information and I can enter it manually for you. You can also try using this link to enter if Rafflecopter is not appearing.